Krakatau erupting on May 27, 1883. From Symons, G., 1888, The Eruption of Krakatau and Subsequent phenomena: Reports of the Krakatau Committee of the Royal Society, Trubner, London. The renowned volcano Krakatau (or Krakatoa) lies in the Sunda Strait between Java and Sumatra. 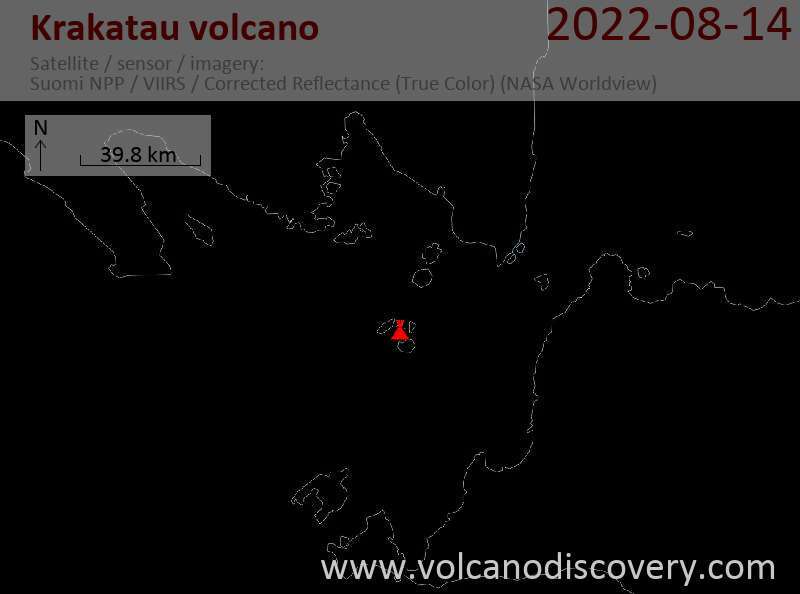 Collapse of the ancestral Krakatau edifice, perhaps in 416 AD, formed a 7-km-wide caldera. Remnants of this ancestral volcano are preserved in Verlaten and Lang Islands; subsequently Rakata, Danan and Perbuwatan volcanoes were formed, coalescing to create the pre-1883 Krakatau Island. Caldera collapse during the catastrophic 1883 eruption destroyed Danan and Perbuwatan volcanoes, and left only a remnant of Rakata volcano. This eruption, the 2nd largest in Indonesia during historical time, caused more than 36,000 fatalities, most as a result of devastating tsunamis that swept the adjacent coastlines of Sumatra and Java. Pyroclastic surges traveled 40 km across the Sunda Strait and reached the Sumatra coast. After a quiescence of less than a half century, the post-collapse cone of Anak Krakatau (Child of Krakatau) was constructed within the 1883 caldera at a point between the former cones of Danan and Perbuwatan. Anak Krakatau has been the site of frequent eruptions since 1927. 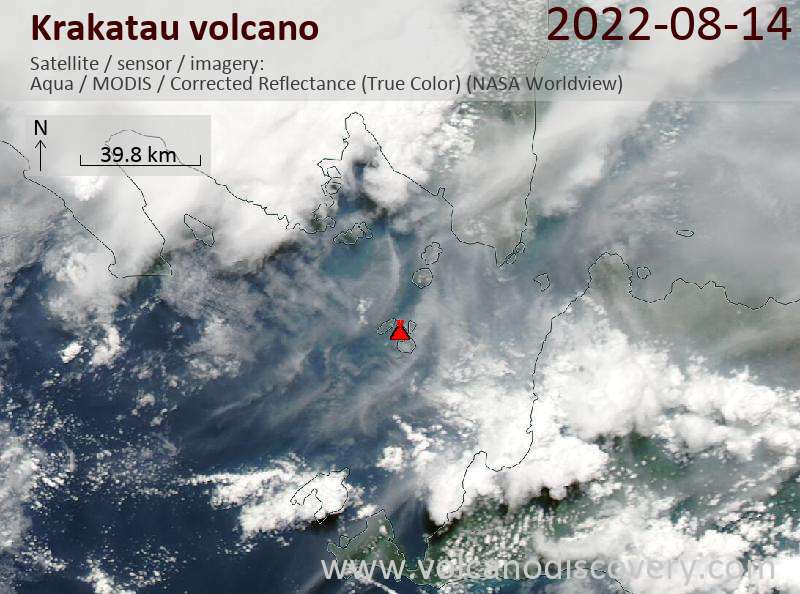 NASA satellite image of the island group of Krakatau. Close-up of Anak Krakatau volcanic island, with its recent lava flows well visible. This eruption, the 2nd largest in Indonesia during historical time (the most violent being the eruption of Tambora in 1815), caused more than 36,000 fatalities, most as a result of devastating tsunamis that swept the adjacent coastlines of Sumatra and Java. Pyroclastic surges traveled 40 km across the Sunda Strait and reached the Sumatra coast. After a quiescence of less than a half century, the post-collapse cone of Anak Krakatoa ("Child of Krakatoa") was constructed within the 1883 caldera at a point between the former cones of Danan and Perbuwatan. Anak Krakatau has been the site of frequent eruptions since 1927.